In terms of specificiations, it's important to point out that the SX800-LTI is not a product that is fully compliant with the SFX specifications. 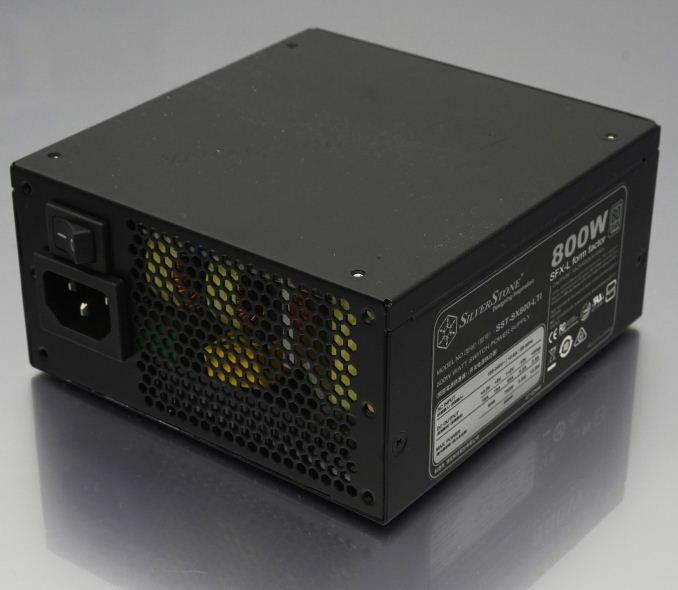 As with nearly all high output SFX designs, the SX800-LTI is an “SFX-L” PSU that meets all of the SFX specifications, except from the length. It is the longest SFX unit that we have ever seen to this date, measuring 125 (W) × 63.5 (H) × 130 (D) mm (4.92" x 2.5" x 5.12"), a good 30 mm deeper than a SFX-compliant unit. This added length significantly limits the compatibility of the PSU, as a large percentage of the SFX case designs do not offer that much clearance. 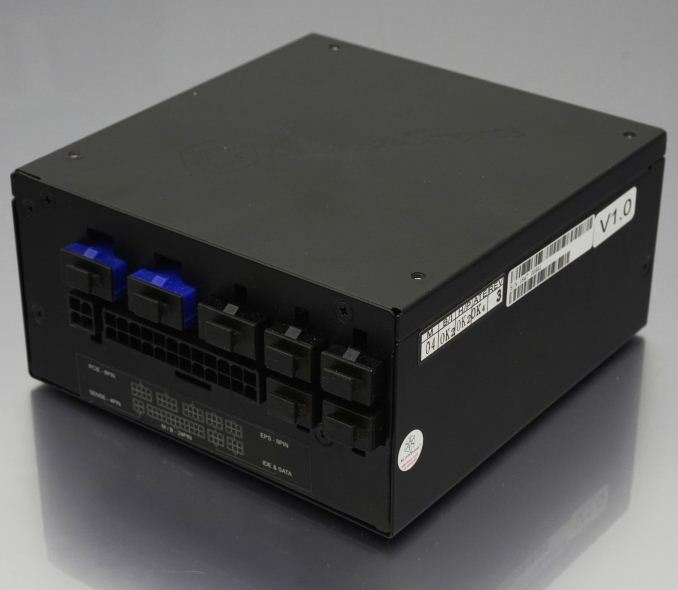 Typically for a SilverStone PSU, the design of the SX800-LTI is simple, yet not aesthetically apathetic. A satin black paint with good anti-fingerprint properties covers the chassis and the company logo is subtly embossed at the top side of the PSU. Both the fan and the finger guard are black, with no lighting, but with a metallic crest featuring the company’s logo covering the fan’s engine. 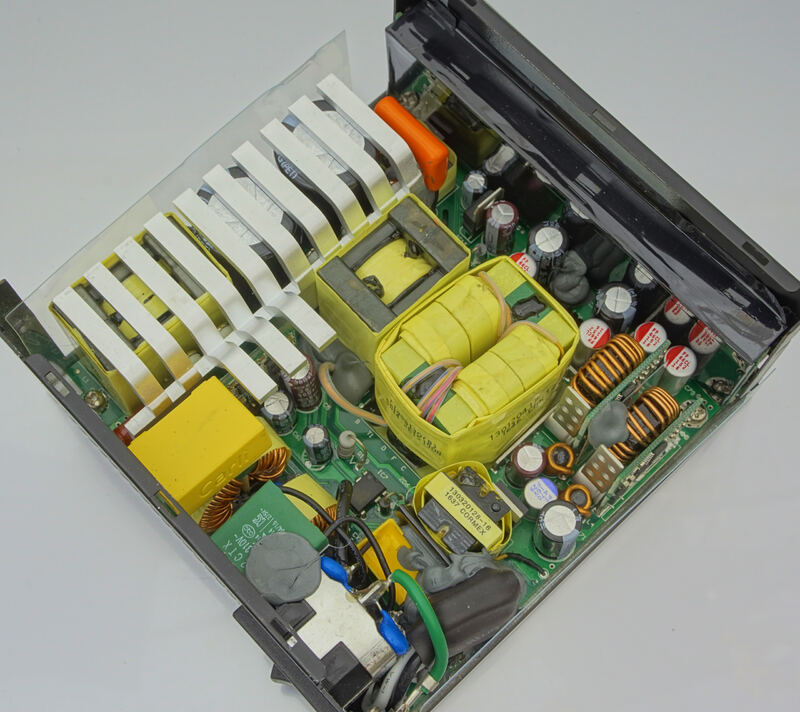 A dark sticker with the electrical specifications and certifications of the PSU can be found on its left side. On the right side of the chassis, which usually is out of the view of case windows, SilverStone placed the necessary white production (serial, version) and quality control stickers. 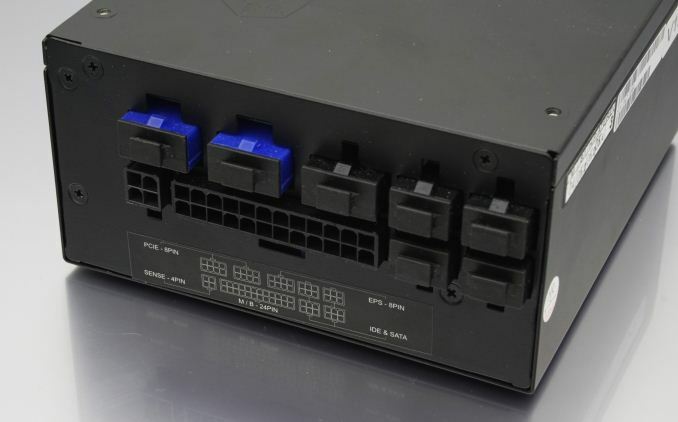 It is noteworthy to mention that SilverStone managed to fit an on/off switch next to the AC cable receptacle on the rear side of the SX800-LTI, something not very common on high power SFX designs. The front side is covered by the asymmetrically placed cable connectors. The placement of the rightmost two connectors suggests that this chassis was not initially meant to have that many connectors and that they were added by the designer after they managed to squeeze the components for an 800W behemoth in that small chassis. All of the cable connectors except from those of the ATX cable are covered with plastic protective caps. A major advantage of the SFX-L chassis is that it allows for 120 mm fans to be installed, a necessity for consumer-grade products where sound pressure must be kept down to civil levels. Globe supplies the low profile 120 mm fan that we found in the SX800-LTI. It is a standard sleeve bearing model with a maximum speed of 2300 RPM at 12 Volts. 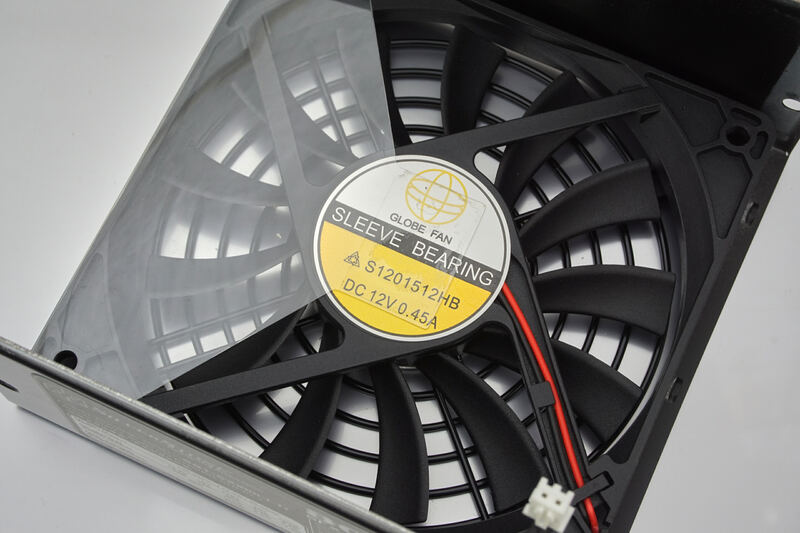 Many enthusiasts will voice concerns regarding the reliability of such a high speed fan in comparison to other bearing designs, but SilverStone generally prefers to use sleeve bearing fans because of their lower noise output, even for their top-tier products. At the very least, Globe is a company with a proven high reliability record. Most people would reasonably presume that the SX800-LTI is just a beefed-up or upgraded version of the SX700-LPT. That is not the case as the SX800-LTI is an entirely different design and is also coming from a different OEM. 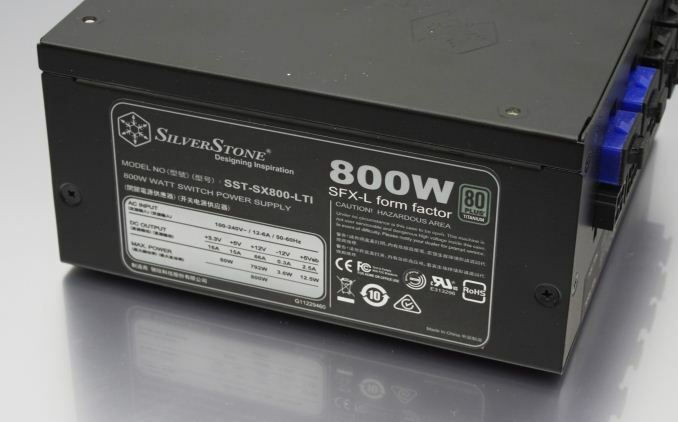 Enhance Electronics is behind the creation of the SX800-LTI, the OEM behind most of SilverStone’s PSUs. The platform that the SX800-LTI is based on is not simple, yet not particularly advanced either. It is based on a proven recipe, with an LLC resonant half-bridge inversion circuit on the primary side and a typical single (12V) converter on the secondary. The minor rails are being generated via DC-to-DC converters. We have seen the same core design in computer PSUs of all efficiency ranges, including 80Plus Bronze certified units. 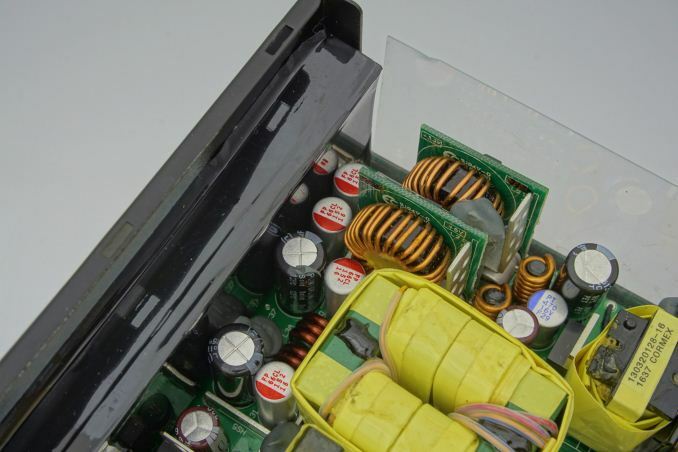 Enhance Electronics managed to reach 80Plus Titanium efficiency levels by simply replacing the typical active electronic parts with their first-rate counterparts that have minimal energy losses. 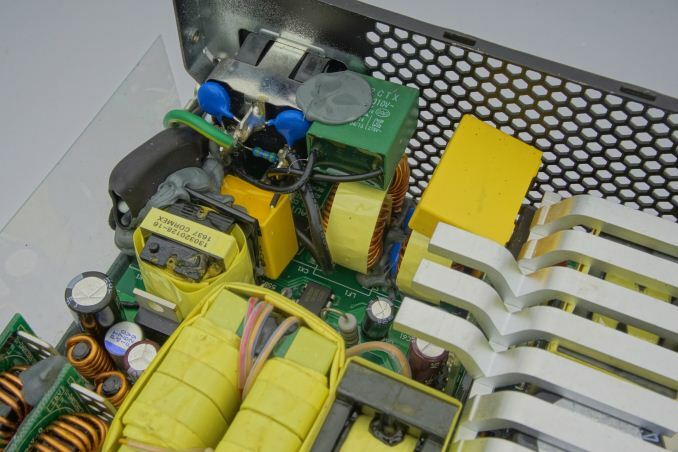 However, these ultra-high efficiency parts are many times more expensive than the typical parts we typically find in mainstream units, significantly increasing the production cost of the PSU. Most of the filtering stage parts are behind the AC receptacle, with a few onto the main PCB. There are a total of four Y capacitors, three X capacitors, and two filtering inductors. The single rectification bridge is sharing the same large heatsink as the APFC and primary inversion side components. The passive PFC components are a large shielded filtering inductor and two 420V/270μF capacitors from Rubicon. The capacitors are the largest SilverStone could fit in there and they are practically touching the heatsink, which is worrying considering that temperature is one of the primary factors affecting the longevity of capacitors. Despite the large heatsink housing the primary side components, there is virtually no heatsink for the secondary side conversion MOSFETs. 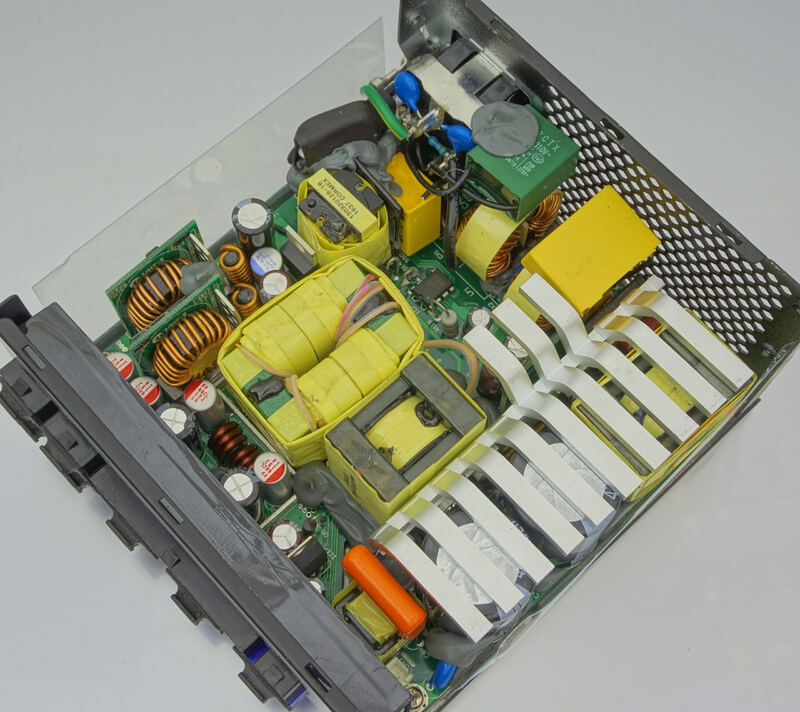 They are mounted on the underside of the PCB and they are so efficient that the chassis of the PSU alone provides more than enough heat dissipation for them to operate seamlessly even when heavily loaded. The capacitors on the secondary side are a mix of electrolytic and solid-state products, and are coming from several different companies. 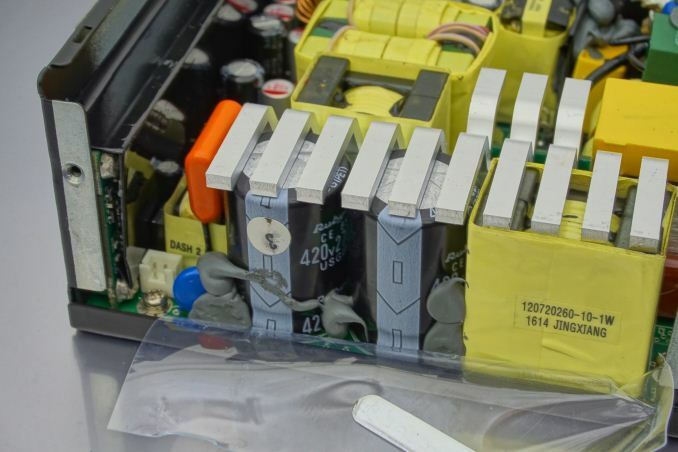 We identified Rubycon, Nippon Chemi-Con, Nichicon, and Unicon capacitors in the mix. The first three companies are very well known and respected. Unicon on the other hand is not such a popular manufacturer, but they too are a Japanese-based company.